Take a pinch of bouncy guitar riffs. Add a dash of uplifting falsettos. Mix it all together with frenzied beats and you’ll get Torches, the debut album from L.A.-based band, Foster the People. The group first caught the attention of music-lovers with their self-titled EP, released earlier this year. 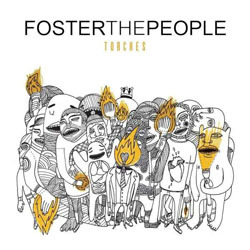 Short and sweet, their EP struck a chord with boisterous feel-good tracks such as the single, “Pumped Up Kicks.” In Torches, the band takes a similar route. The album begs to be danced and sang along to, brimming with catchy hooks and smooth electropop. The influences in Foster the People are blatant and undeniable. Labeled by zealous fans as the next MGMT or Phoenix, the group certainly hints at familiar techniques. But though their sound is admittedly derivative, their fresh take on traditional inspirations turn Torches into an album that is anything but tired. Foster the People never fails to surprise, whether it’s the odd yet fitting combination of tribal rhythms with soul-ladden piano chords in “Hustling (Life on the Nickel)” or the jazz and swing of “Miss You.” Their unexpected blend of styles and ingenious use of instruments keep each track distinct, both from their musical predecessors and each other. But rarely can a band have it all. While Foster the People excels in their innovative execution, they are sadly lacking when it comes to poetic lyrics. Dropping lines such as “Ooh la la, I’m falling in love/and it’s better this time than ever before,” Foster the People doesn’t exactly captivate you with their stunning lyric-penning skills. However, easy rhymes mixed with fast-paced beats make Torches the ideal summer album. So, go ahead and bust out those moves. Your secret is safe with us.